DEVOtional 2015 sets attendance record! The DEVOtional 2015 was the most well-attended in the history of the event! The first-ever DEVOtional was way back in 2000. A couple major factors played a part in this year's larger-than-normal attendance. 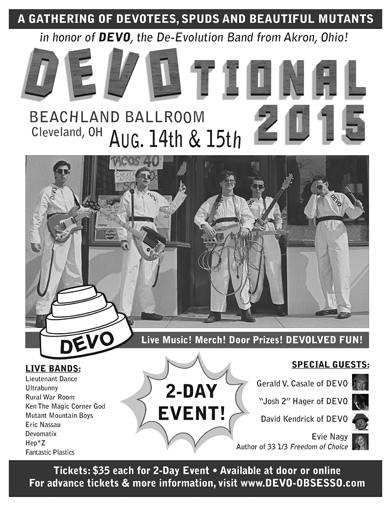 It didn't hurt that there was an unveiling of permanent DEVO street art scheduled in Akron, OH on the morning of Sat., Aug 15th - the main day of our DEVOtional event in Cleveland. We got TONS of press because of that art installation, which really helped spread the word. Another reason for the increased ticket sales was the limited edition "Nutty Buddy" tape given to the first 100 advance ticket buyers. Thanks to Futurismo for that! (Futurismo is the UK label who released DEVO's "Miracle Witness Hour (Live 1977 at Eagle Street Saloon)" LP/CD in 2014). We sold 100 tickets in advance for the first time ever - thanks, Spuds! We're going to offer something similar next year to advance ticket buyers, so stay tuned. Our DEVOtional 2015 special guests included Gerald V. Casale of DEVO, Josh "Josh2" Hager of DEVO, David Kendrick (Former drummer for DEVO), and Evie Nagy, author of 33/ 1/3 "Freedom Of Choice" book. A gaggle of great bands performed on both Friday & Saturday: DEVOmatix, Lieutenant Dance, Ken The Magic Corner God, Hep-Z, Rural War Room, Eric Nassau, and Mutant Mountain Boys. This year we welcomed DEVOtees from all over the globe to our DEVOtional event. In addition to the spuds who traveled from all over the USA, we also had DEVOted visitors from Canada, Scotland, Japan, and Chile! FREE FOOD starts at 11am. Free Chili Dogs & Tacos! DEVOtees started showing up at The Beachland Tavern late on Friday afternoon to mingle with mutants they hadn't seen since last year's DEVOtional and brand new spud buddies they only knew online until now. It's always nice to see how many different decade-spanning DEVO T-Shirts are on display during DEVOtional weekend! Oddly enough, there was a pajama party/concert going on in the Beachland Ballroom while we were having our Friday DEVOtional in the Beachland Tavern. The bar opened around 6pm and bands started pretty close to 7pm. I think we finally went back to the hotel sometime after 1am....then found reason to stay up chatting till around 3am. Wait, don't I have to get up early in the morning again...? Me and my spudly comrades (Tim, Antonio, and Allison) had to show up mega early in Akron to set up for the morning's events, including the DEVO art unveiling, march of the Booji Boy clones, etc. We had limited edition prints, Energy Domes & t-shirts to sell, so we wanted to get there in time to secure a good spot for our table. Did I mention we stayed up until 3am the night before? Oh...and the night before that, too. When there's DEVO fans from all over the globe hanging out at the same hotel, then that time-consuming sleep can wait till I get back home to North Carolina! Spud time is quality time. I was already exhausted from the activities in Akron when I showed up in Cleveland to set up my DEVOtional wares at the Beachland Ballroom on Saturday. We drove straight from the Akron art unveiling directly to the Beachland...no lunch...no time to spare! Had 1 hour to set up in time for doors to open at 2pm....but seeing the friendly, familiar faces of my DEVOtees gave me the energy I needed to continue on (with the additional help of an ice cold Red Bull... the legal drug)! I've tried to remember details from the 12-hour event...but all I can recall is a blurry whirlwind of activity and conversations from 2pm until late that night. Thank goodness we have phones with cameras these days to help fill in the blanks! That said, I'll let the photos & videos do most of the talking. Check out the thumbnail images & links below! Video of DEVOmatix performing "The Day My Baby Gave Me A Surprise"
Video DEVOmatix & Jerry Casale of DEVO performing "Be Stiff"
Video of DEVOmatix performing "Going Under"
Thanks to everyone who came together to donate their time, money and resources to make this event happen - Nick Ciasullo (for being our fearless manager of all the gory details), Joe & Ren Provo (as always! ), Rev. Toth Wilder (in the trenches in Ohio! ), all the bands & artists and everyone who contributed in any way! It couldn't be done without you, of course. Let's do it again in 2016! DEVOtional 2016 is already being planned! See you there!